You are here: HomenextMain SubjectsnextWW2 and Victory PartiesnextWhen? Where? Who? Can you remember when or where this photo was taken or what the occasion was? Robert Nichols supplied the image, but has little information except that the elderly lady in the black hat, third from right back row, was his mother, Mrs F.M. Nichols. The tall lady top row 6th from left was Mrs Clark and the first lady top line right might possibly be Mrs Santry. Can you help and identify anyone else? I can confirm it was probably a VE day celebration at Hadleigh Council School. I am the girl left of the baby being held up and Doreen Larkin is to the left of me. My brother David is below the lady on the right holding a baby. It looks like a VE day [end of WW 2] party; I was in a similar one in Benfleet, just before we moved to 8 Kingsway Parade, Hadleigh, and these photos were published all over. In fact, the photo I was in is in the Bygone Benfleet book by Norman Chisman. 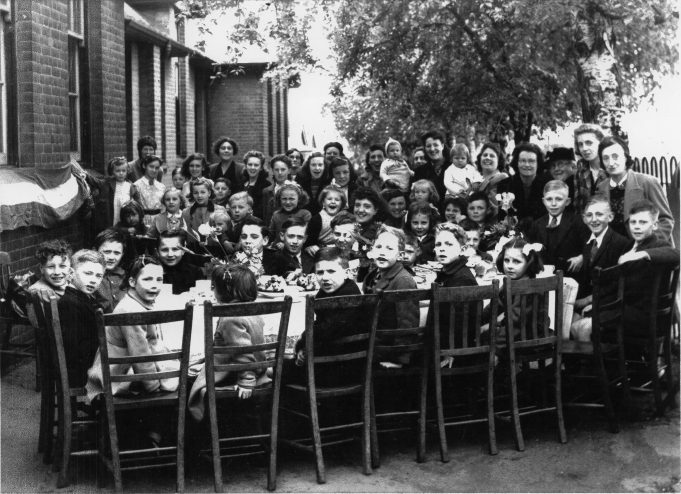 After studying the school lunch photo more closely, I can identify a little blonde girl with the white collar standing on the left, she is my cousin June Thompson, now living in New Zealand. Her family lived in The Avenue, Hadleigh. A lady centre right, in a light coloured coat holding a baby in white appears to be Mrs. Leggett and her daughter Wendy is the little girl last on the right in the front row. They lived near the school in Church Road. Wendy’s brother Peter was my best friend when I joined the school in 1946/7. It would be interesting to know what year it was taken. There is no problem with the location; it was in the infants’ playground on the right hand side of the main entrance of “Hadleigh Council School” as it was then known.